First off, I've tried different versions of Dolphin, they all seem to do this for me. But Dolphin won't recognise it, no matter what I do. What am I missing here? Fake Wiimote? I mean is it an official one? I've tried both the Wiimote that came with my Wii and the Wiimote that came with Zelda Skyward Sword. Both official, neither being picked up in Dolphin. Did the log say the following? 19:50:755 Src\HW\WiimoteReal\WiimoteReal.cpp:440 N[Wiimote]: Wiimote scanning has started. 19:59:554 Src\HW\WiimoteReal\IOWin.cpp:810 N[Wiimote]: Found Wiimote (89:3e:99:cc:23:00). Enabling HID service. 20:03:962 Src\HW\WiimoteReal\WiimoteReal.cpp:679 N[Wiimote]: Connected to Wiimote 1. 20:13:324 Src\HW\WiimoteReal\WiimoteReal.cpp:338 N[Wiimote]: Stopping Wiimote data reporting. 20:33:894 Src\HW\WiimoteReal\WiimoteReal.cpp:353 N[Wiimote]: Resuming Wiimote data reporting. 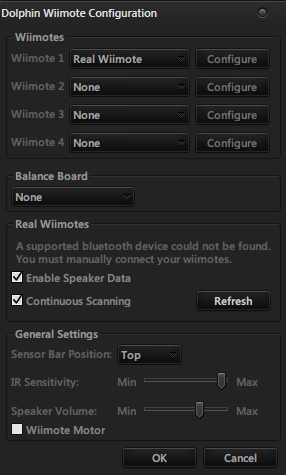 It says Stopping Wiimote data reporting at the moment you click OK in the Wiimote settings, as well as saving settings. The moment you open a game, it will say Resuming Wiimote data reporting, and you will be able to use the Wiimote in game. When it says Wiimote 1 disconnected, press 1 and 2 simultaneously to reconnect. You got to wait about five seconds for Dolphin to respond. About the controller: I wonder why it does not work. Check if the controllers do work on your Wii. Did you let your computer install the drivers for the Wiimote? My laptop came up with an installation for drivers and needed that installation for my Wiimotes to work. 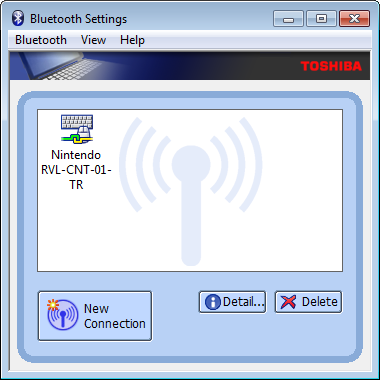 The installation should start as you choose to connect to Nintendo RVL-CNT-01. About Bluetooth: are you using a seperate stack or is the bluetooth from inside the computer? Some stacks give problems. Dunno what logs those even are. The controllers work on my Wii and my Wii U just fine. Not sure if Windows installed drivers for them. Probably. 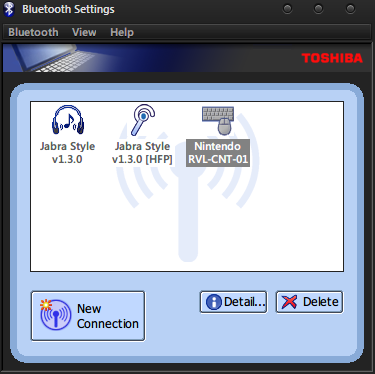 And the only bluetooth stack I'm using is the Toshiba one. The screenshot you showed is not a connected wiimote. Double click the wiimote icon and it will say "Prepare to connect the remote HID device, then click OK". Hit ok, and hit 1+2. When you see the yellow and green lines connected over the icon, THEN it's connected. Since you have continuous scanning on, all you have to do is run a game or open the wiimote settings, and Dolphin will register the wiimote and the wiimote will shake. You're ready to go. It's made for the -TR, but it's the Toshiba Stack so much of the interconnection stuff is the same. I use my Toshiba Stack for both regular Wiimotes and the -TR, so you don't have to worry about it working or not. For the record, this is what a connected wiimote looks like in the Toshiba Stack.